Many doctors will tell you to stay out of the sun. However, that is completely wrong unless you have a past history of skin cancer. The key is to not overdo it, but we definitely need the sun to survive and thrive. We would all be dead without the sun. 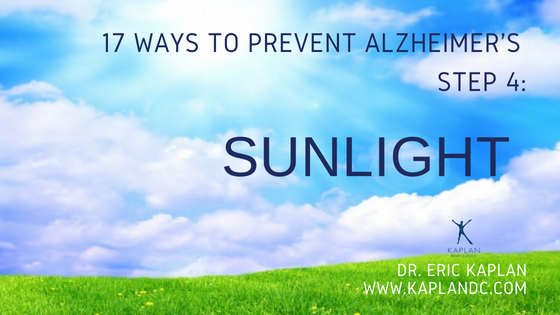 The sun assists us in brain function to prevent Alzheimer’s, and helps with growth, our bony structures, and thyroid function to name a few. It also helps plants grow which will in turn supply us with oxygen so that we can have energy and life. If you are on vacation and you are outside in the sun all day long, I suggest putting on suntan lotion to make sure you do not get burnt. However most days when you are inside and wearing clothes, there is no need for sun tan lotion. Sun tan lotion is the most toxic product on the planet. Sun tan lotion can actually erase permanent marker. What does that tell you about what it is doing to your skin? I recommend the non-toxic sun tan lotions below to my patients. One of the reasons the sun is so important is because of Vitamin D. We need our Vitamin D levels to be above 50 when looking at blood work. Most Labs will report over 30 is normal, however that is comparing you to people who work inside all day and do not spend any time outside. That is not healthy. Every day we need to get our Vitamin D. Almost everyone gets a lunch break. You need to go outside, roll up your sleeves, take off your hat, get out of the shade and stand in direct sunlight for 20 minutes a day with a lot of body exposure. In addition, if you live in northern latitude like NJ or NY you must supplement with Vitamin D. The best product that I have researched is Ultra D by Apex Energetics. In the winter I take 10,000 IU a day and in the summer I take 5000 IU a day. If your Vitamin D levels are high then your brain function and thyroid will improve and you are more likely to prevent Alzheimer’s disease. 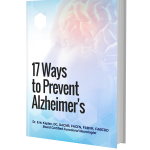 If you are interested in easy natural ways to prevent brain problems, please contact us at 212-620-8121 (NY) 201-261-2150 (NJ) for a FREE Alzheimer’s Assessment or visit our website www.kaplandc.com.